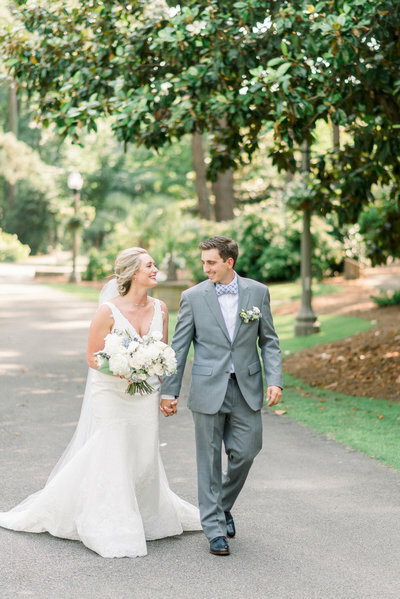 Ashley's style was definitely unmatched. 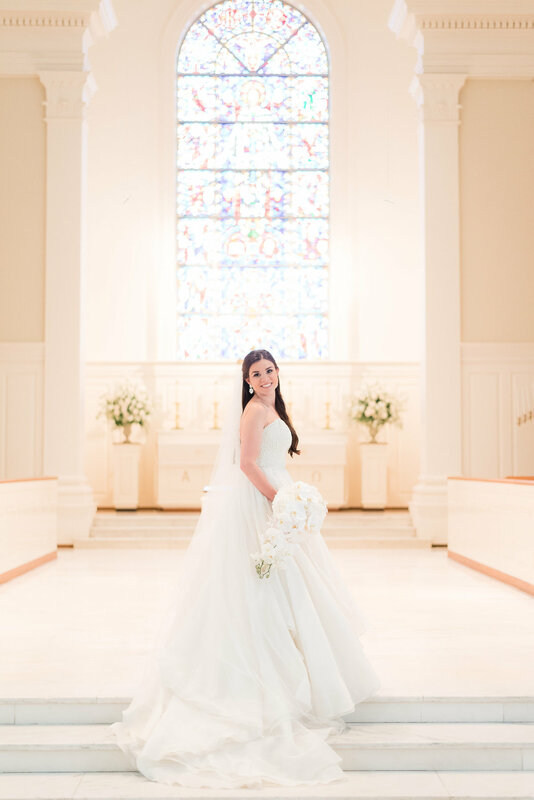 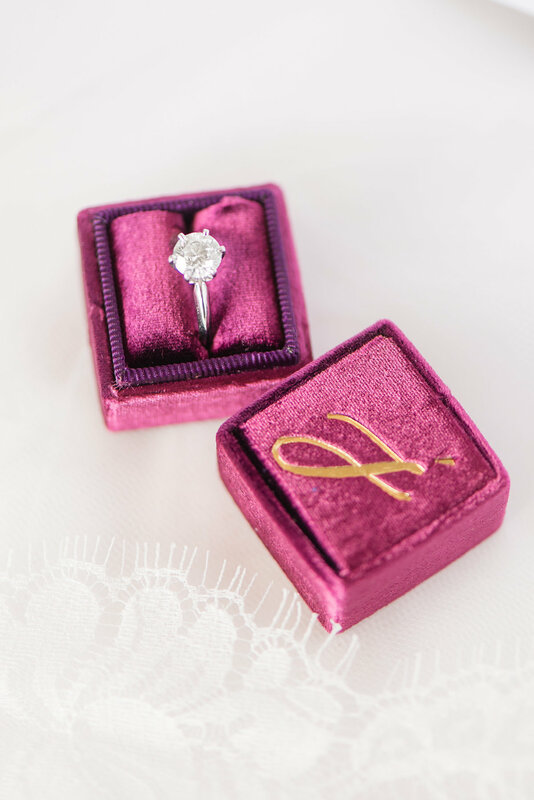 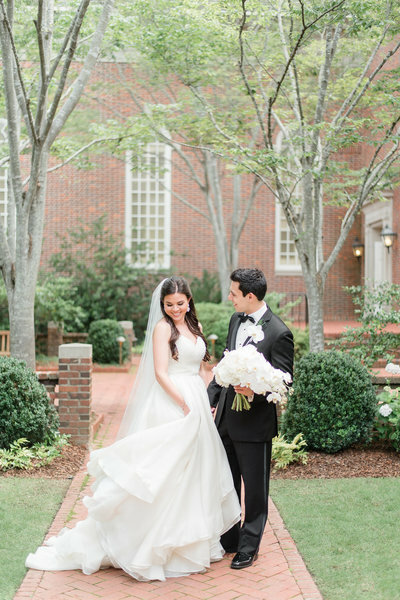 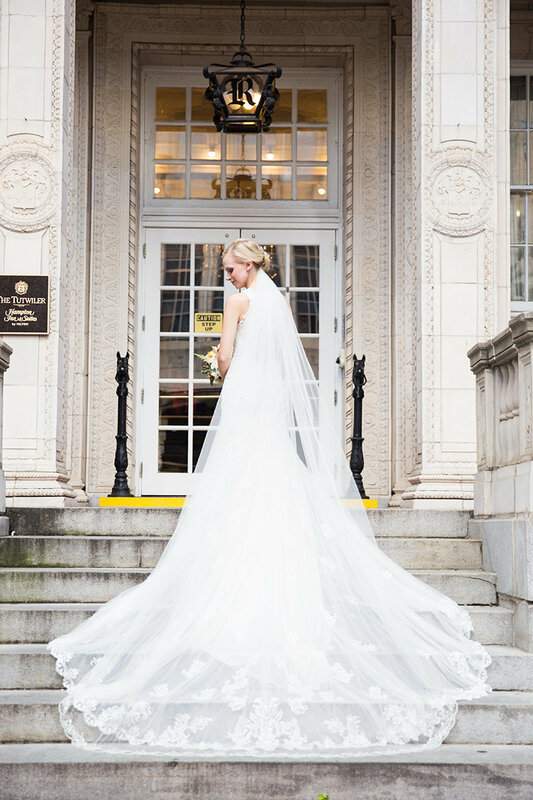 A modern bride with a heart for traditional, Ashley was a dream bride! 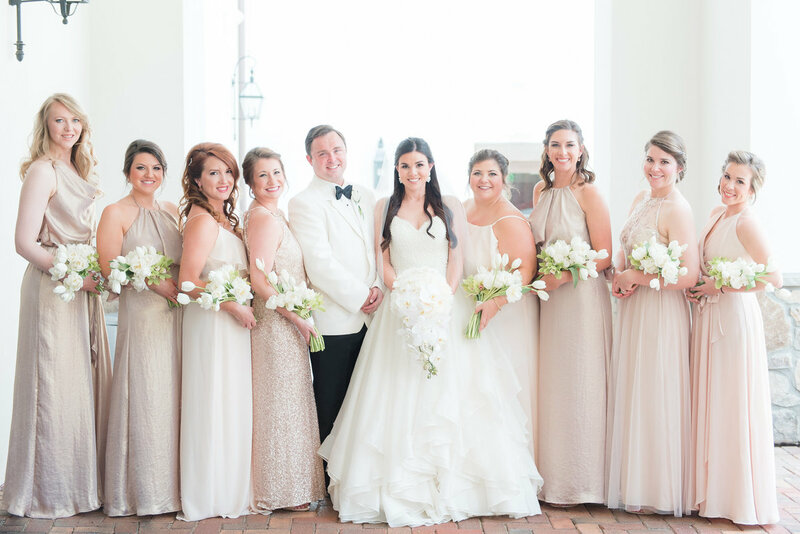 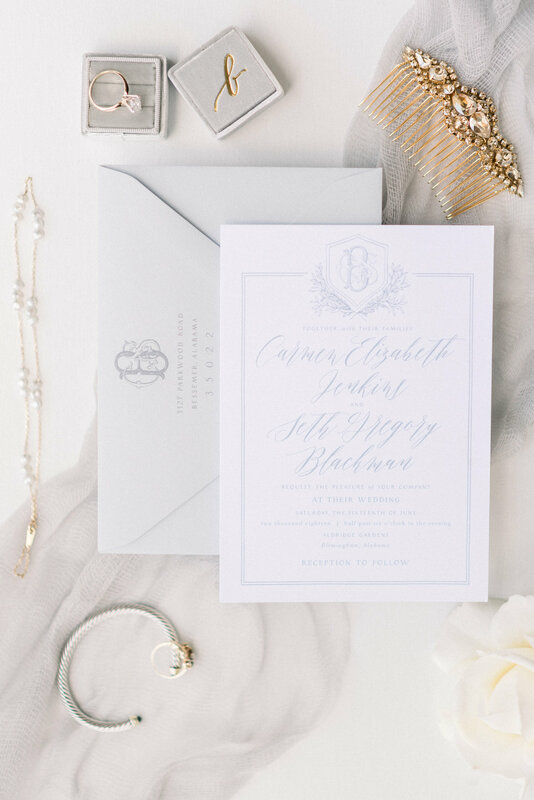 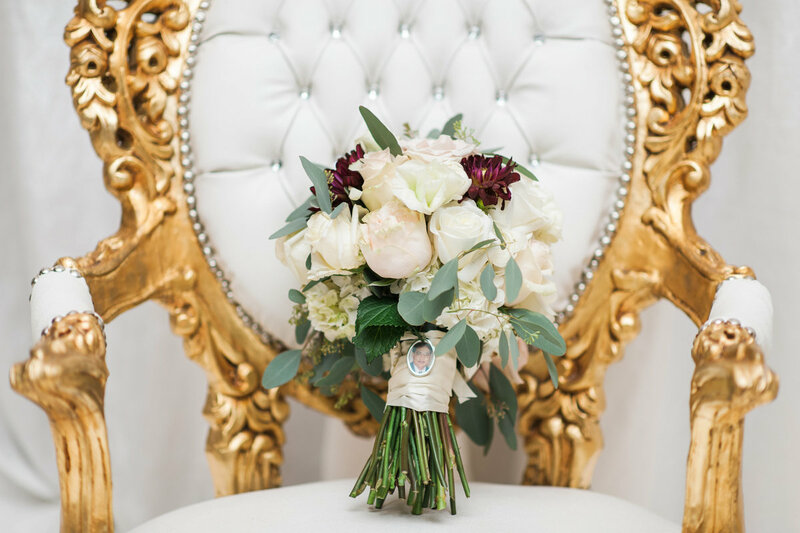 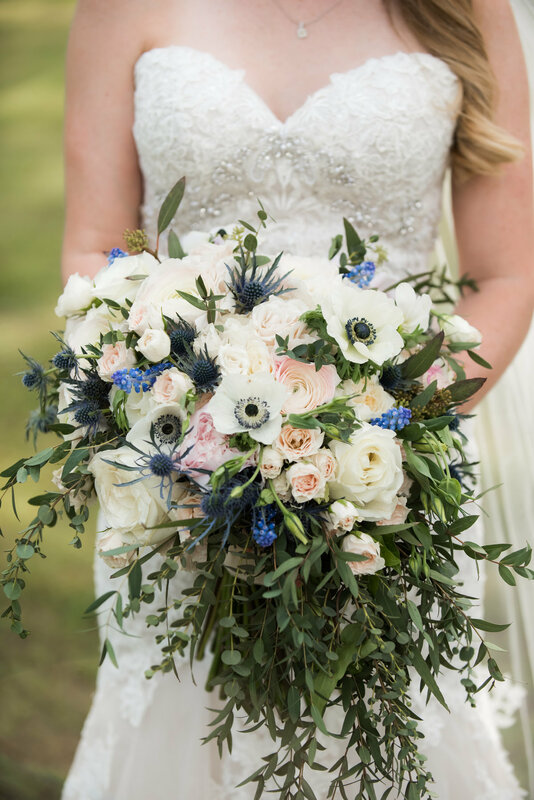 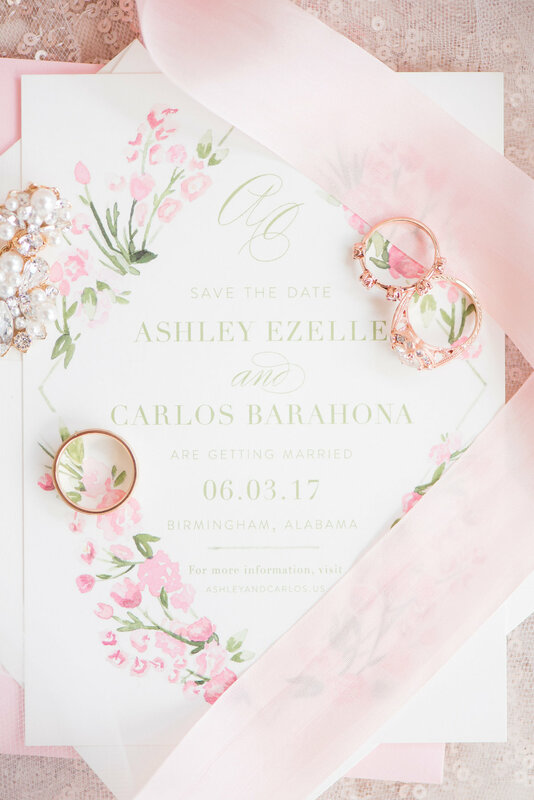 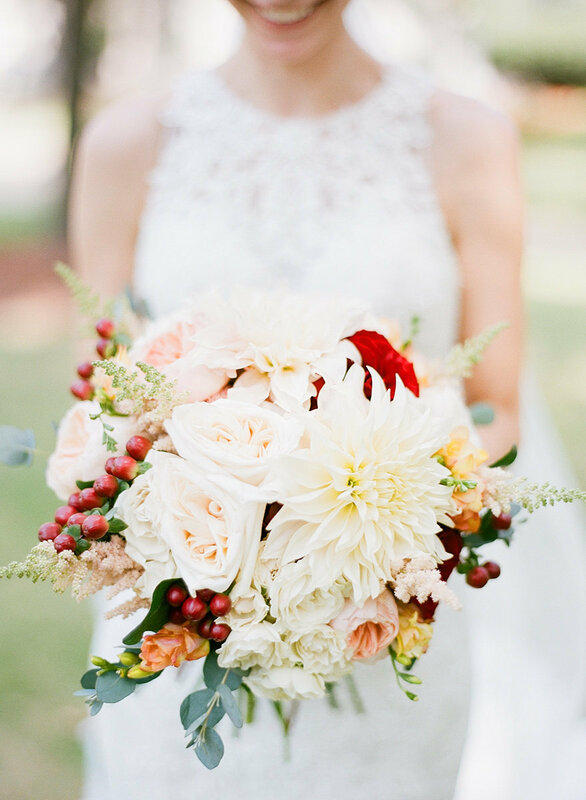 She had a vision of a white wedding day with a splash of color, so that's what she got! 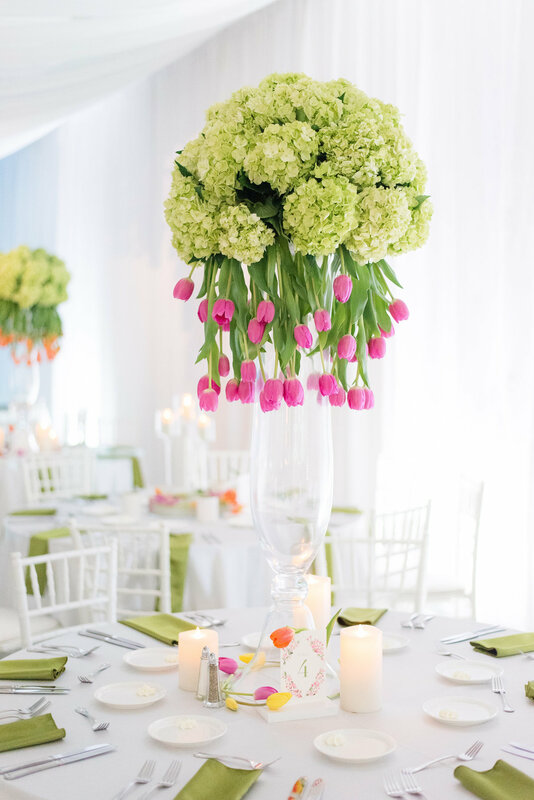 Our absolute favorite floral detail was the 32 foot floral installation (all tulips!) 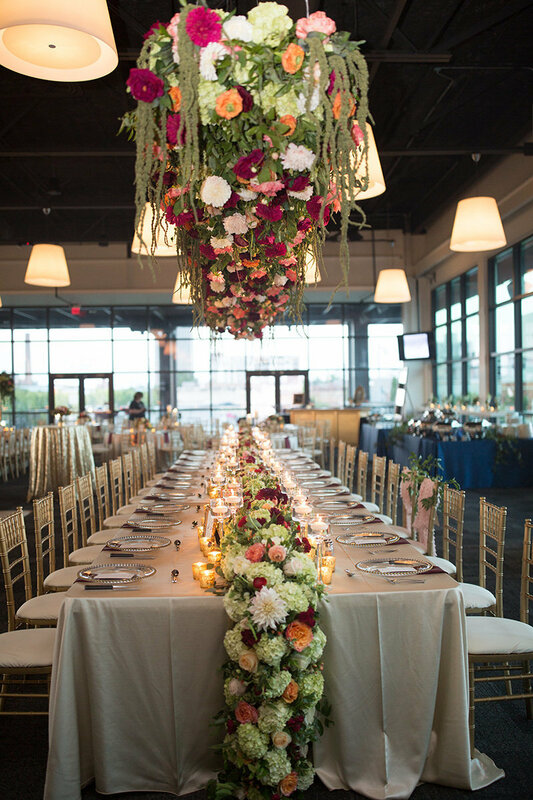 over the head table. 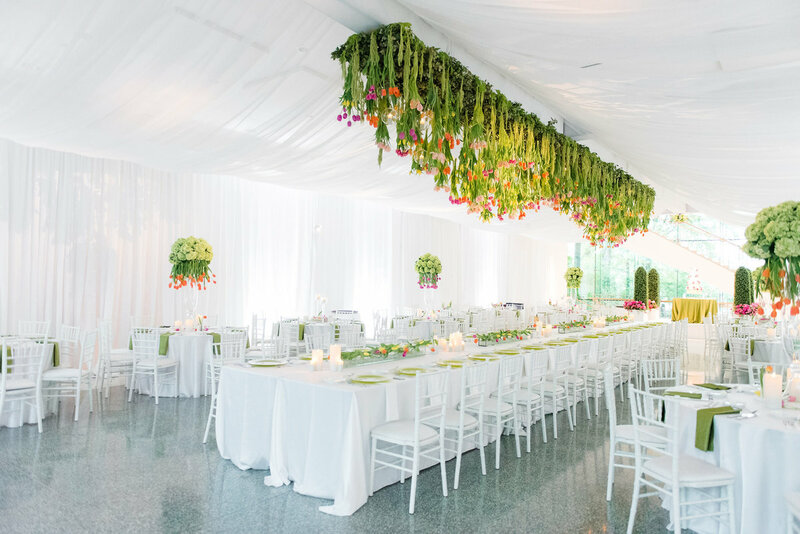 The installation against the all white museum made one of the biggest statements we've ever seen. 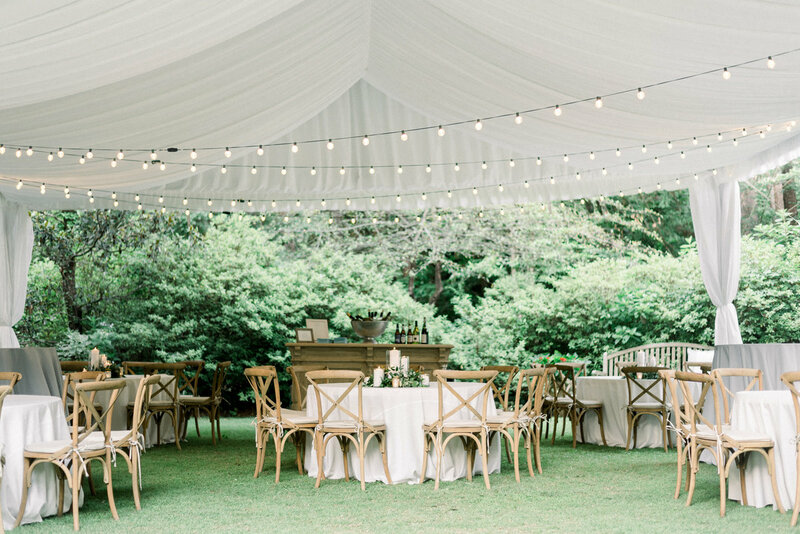 This is a garden tea party like you've never seen before. 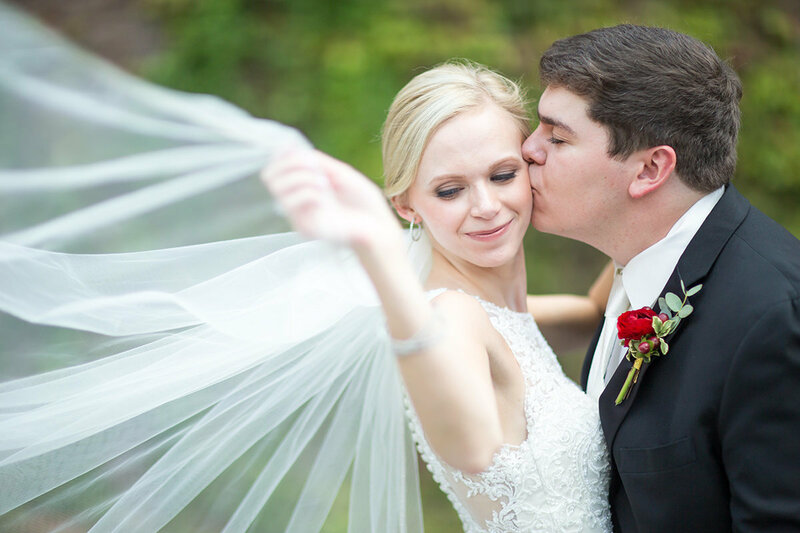 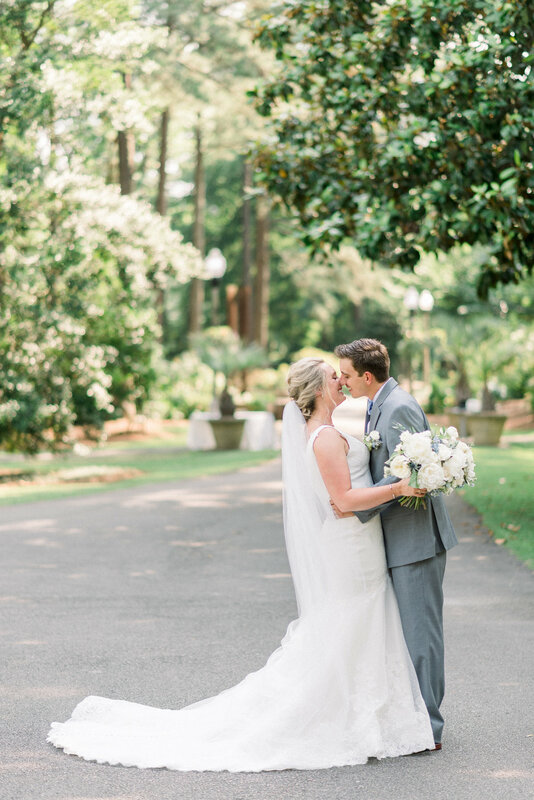 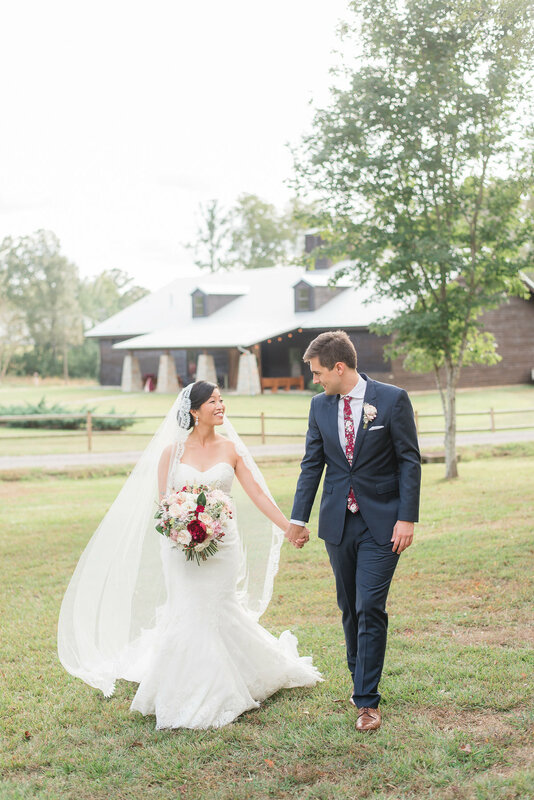 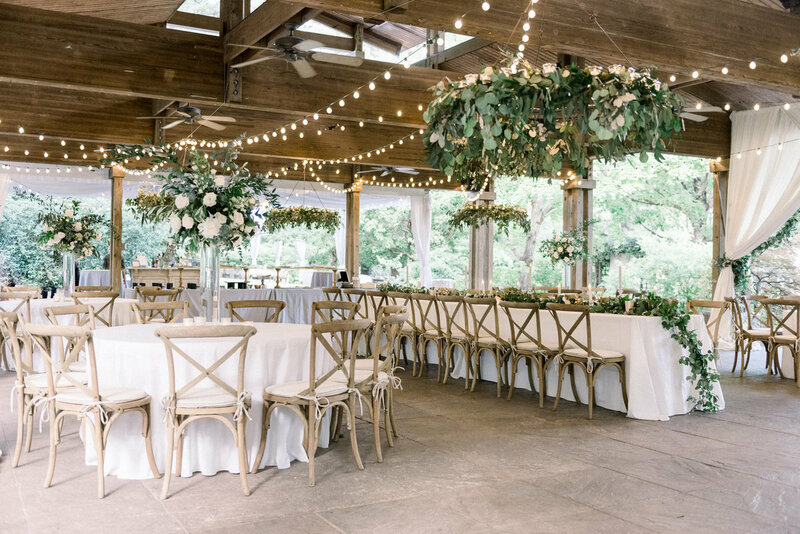 At a stunning family property tucked away beneath the most breathtaking trees you've ever seen, Emily and J.P. celebrated their marriage with all of their family and friends! 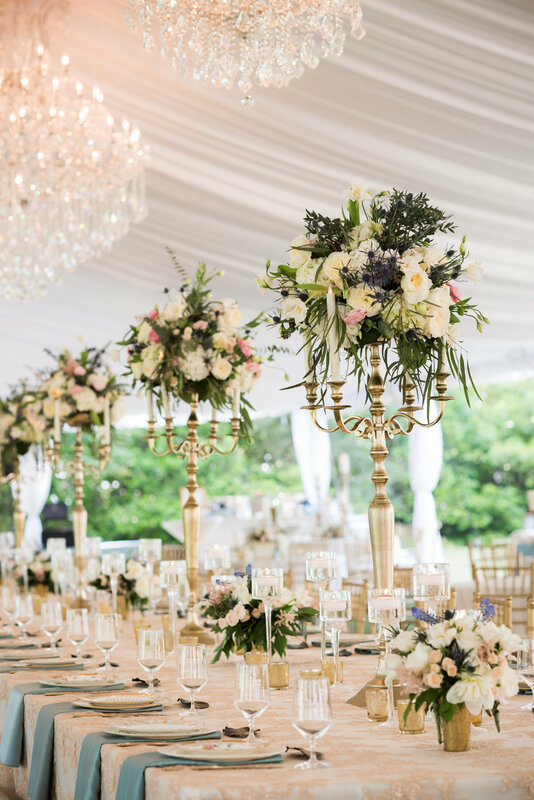 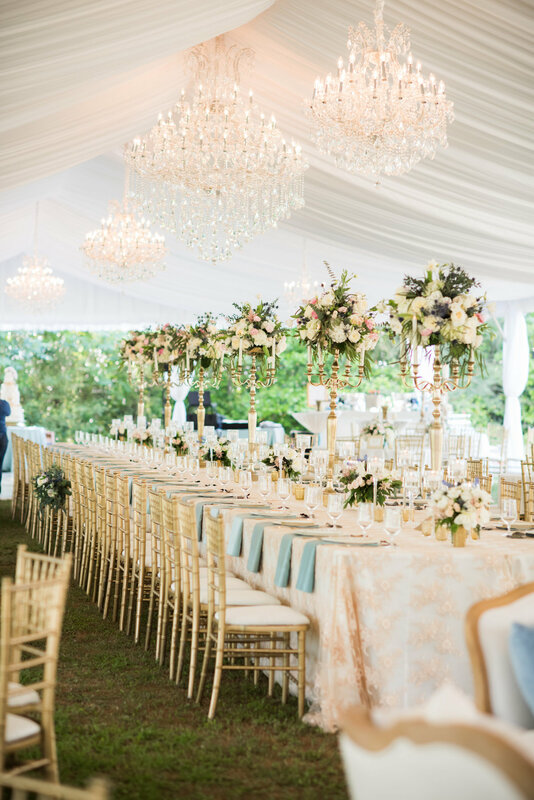 From the beautiful blue tones incorporated from start to finish to dining under glistening chandeliers at tables set for royalty, this was a wedding day to remember. 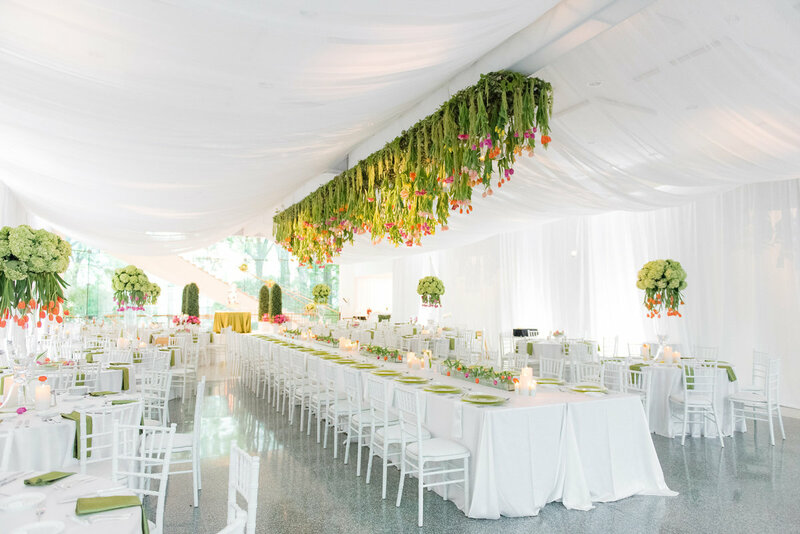 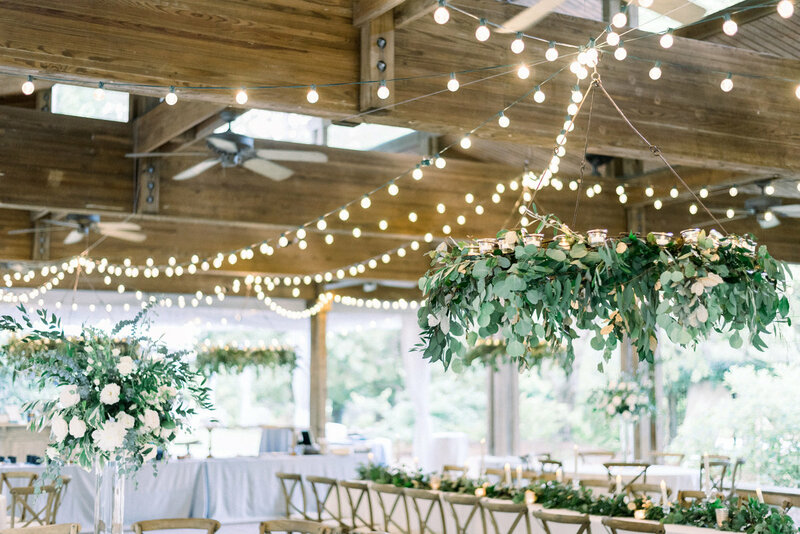 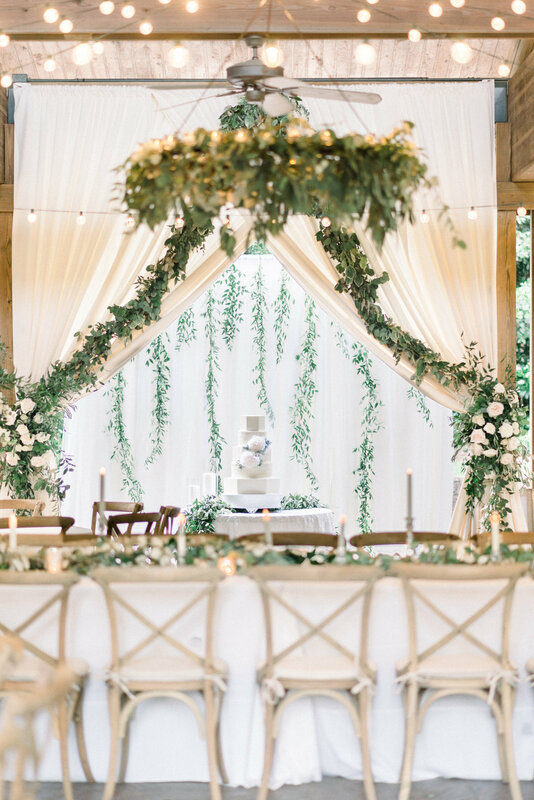 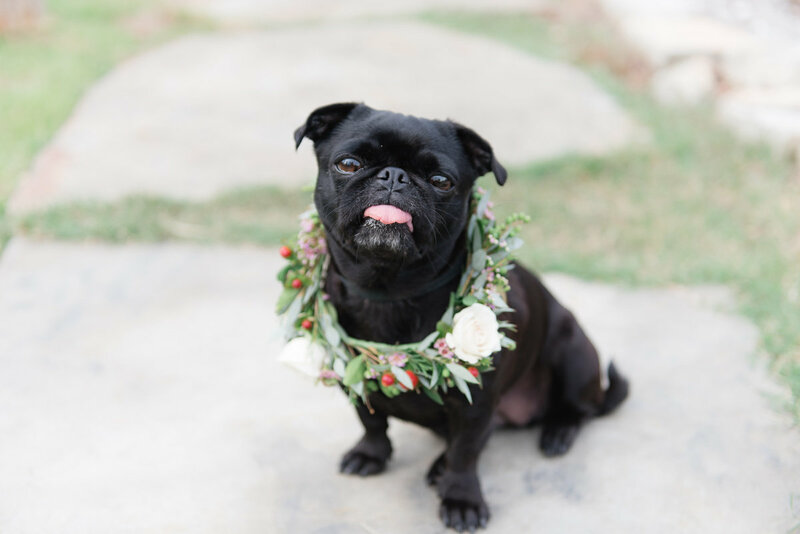 Imagined being greeted to a wedding reception with a 24 foot hanging floral installation and a short film edited for guests to see the first look and earlier moments of Haley and Michael's wedding day! 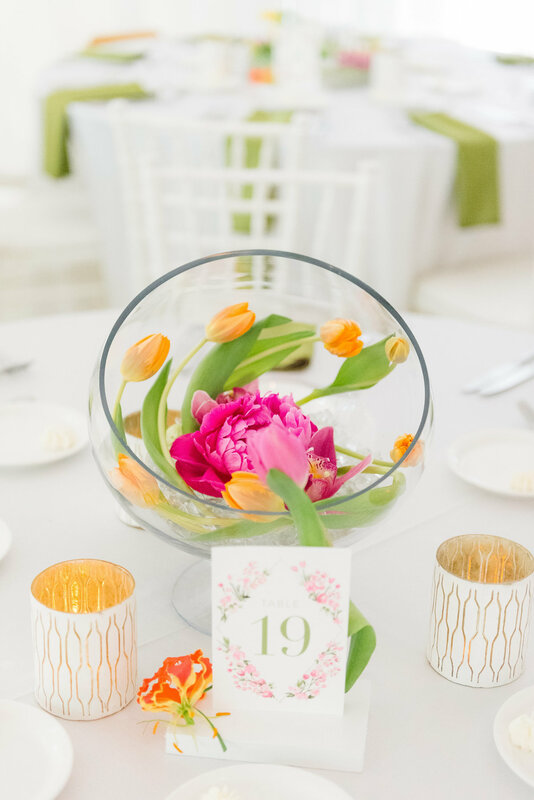 Next you enjoy delicious food, drinks, desserts and a super fun photo booth. 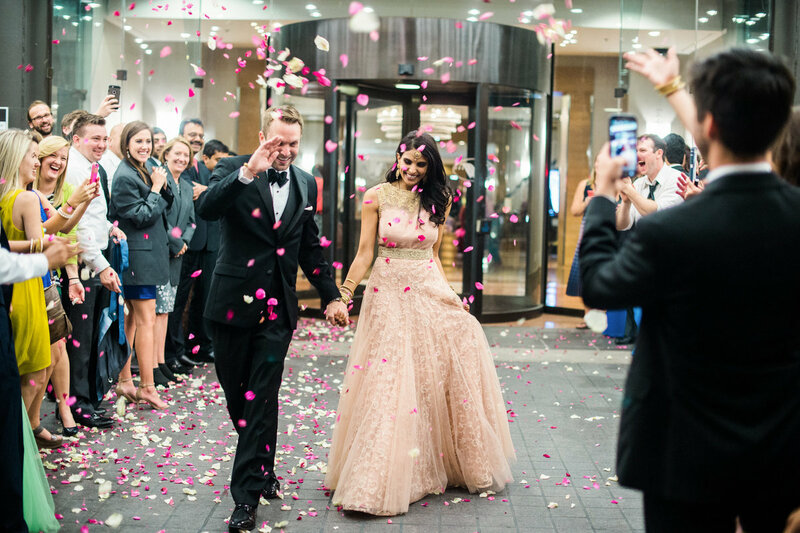 Then you dance the night and end it with celebratory fireworks. 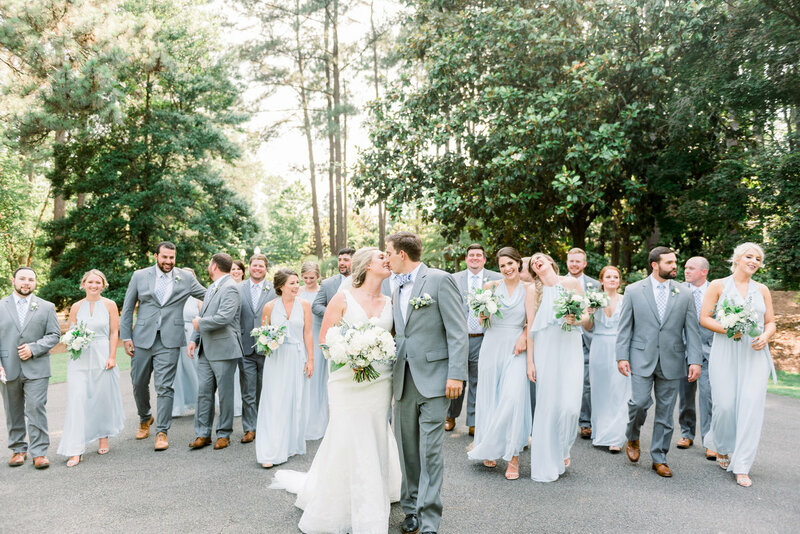 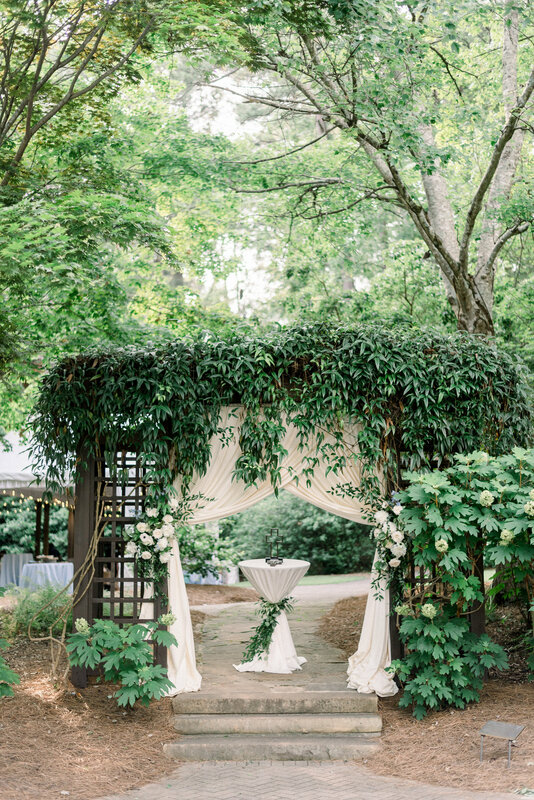 Yep, that was Haley and Michael's wedding day and you can experience it all right here! 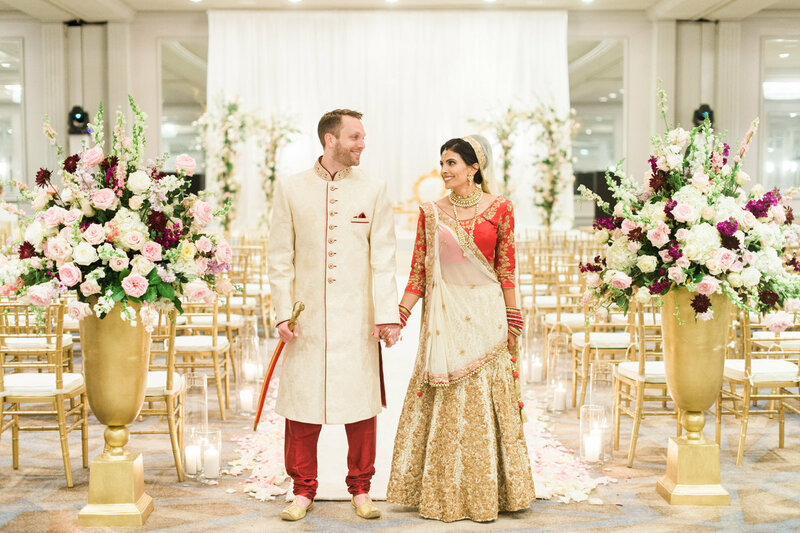 Indian weddings are always some of our most colorful and fun wedding days. 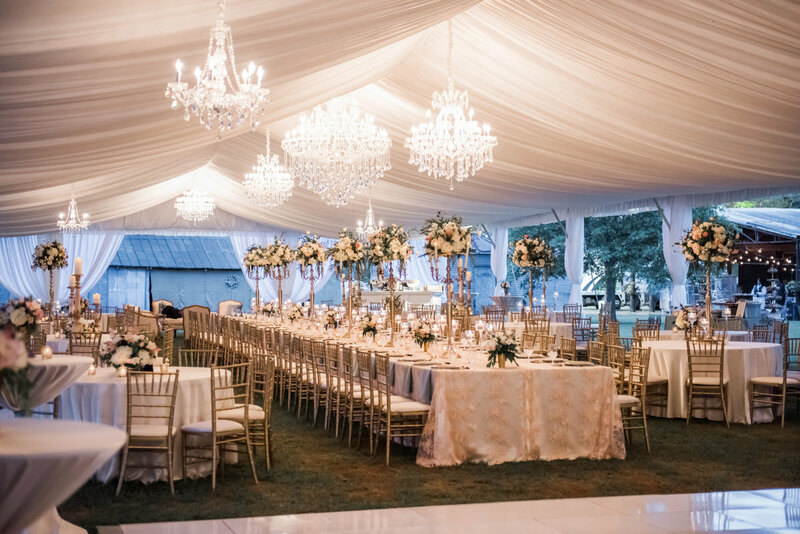 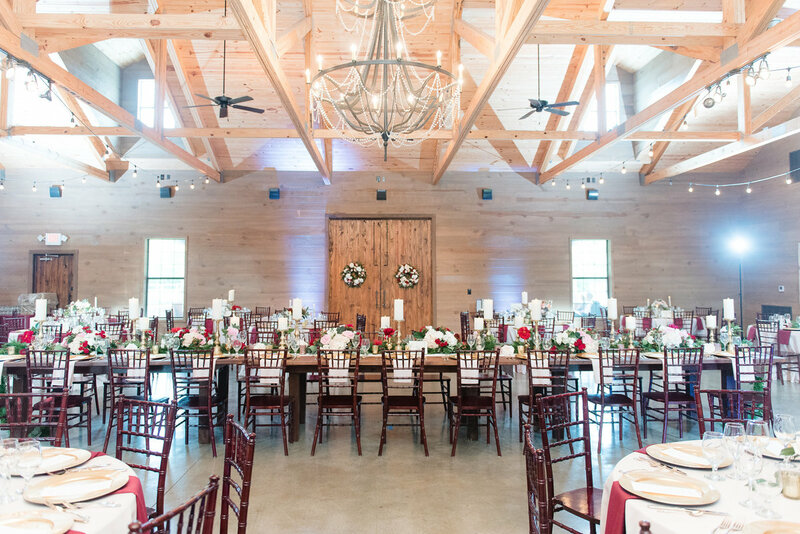 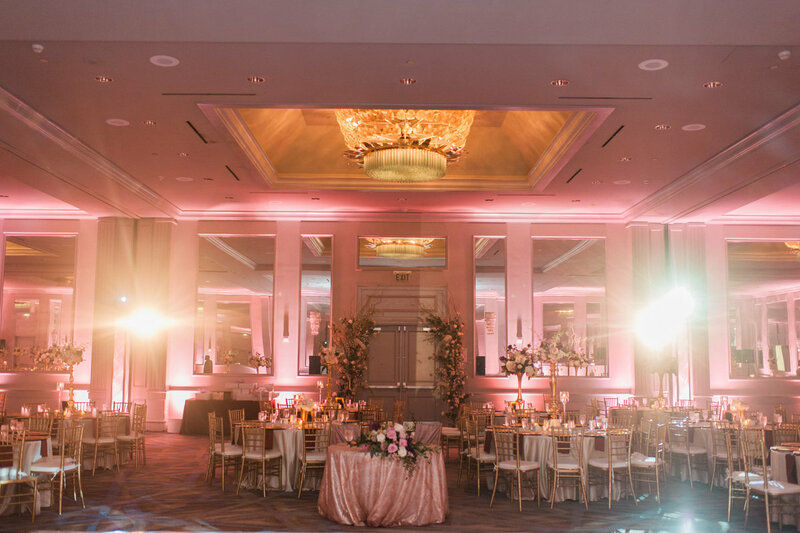 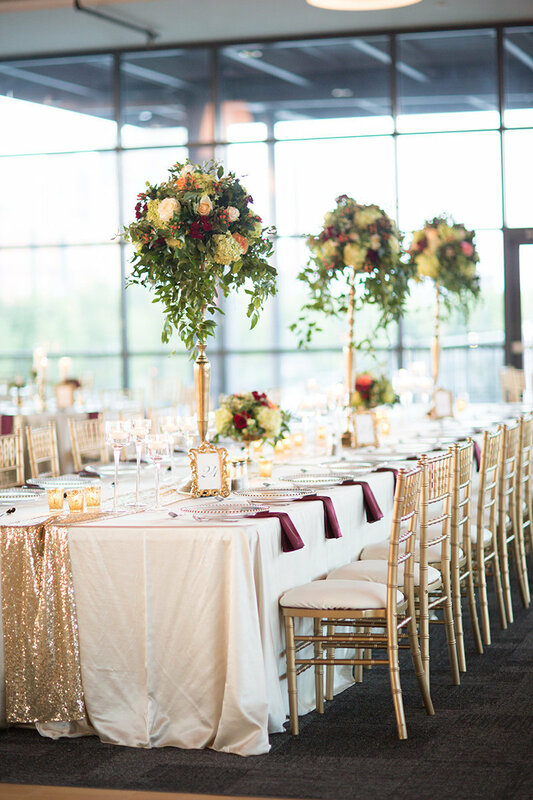 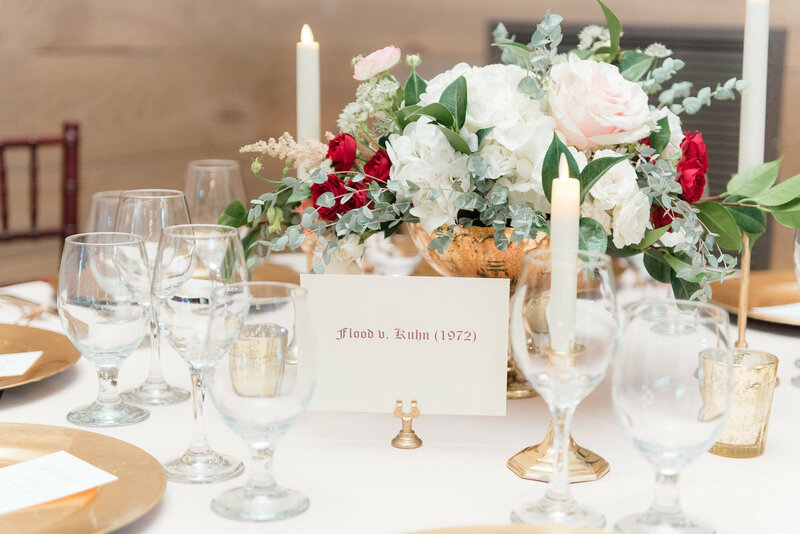 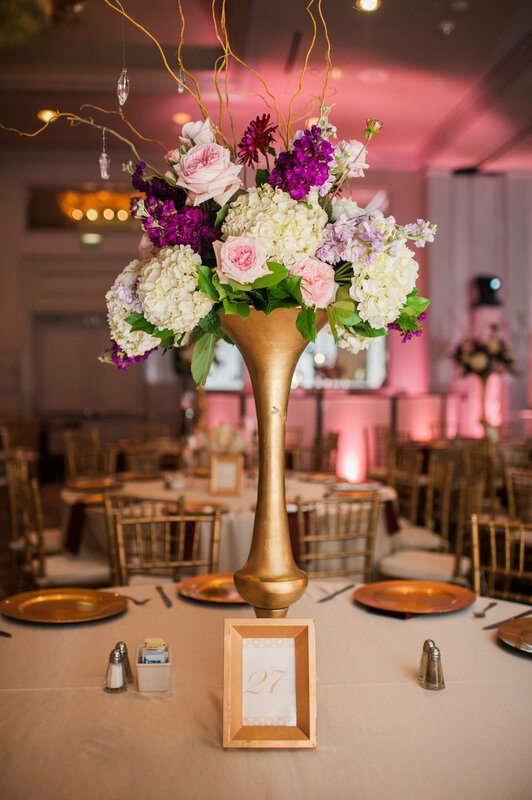 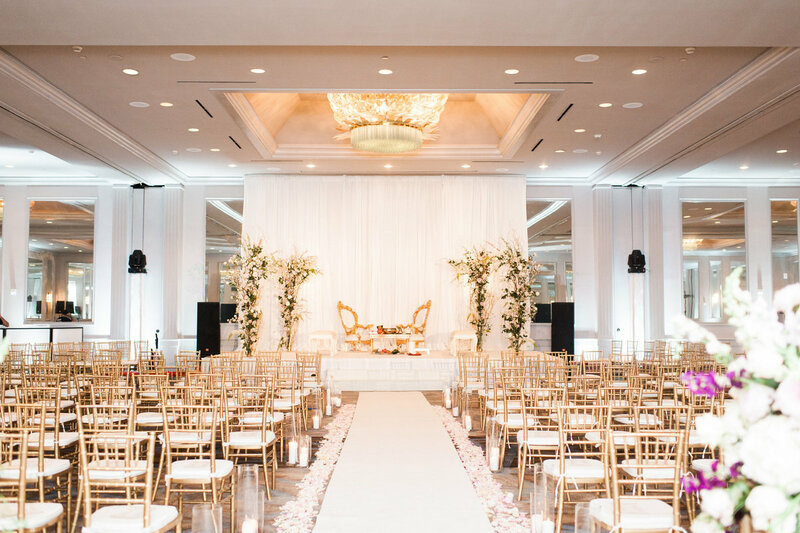 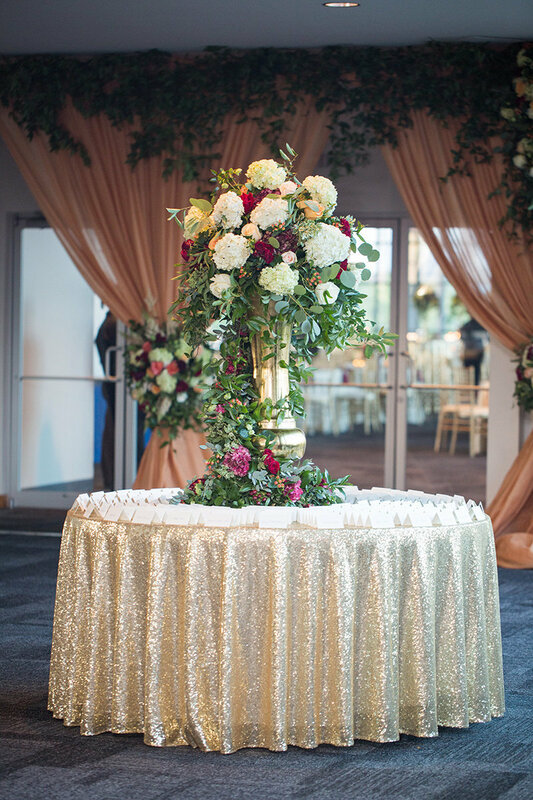 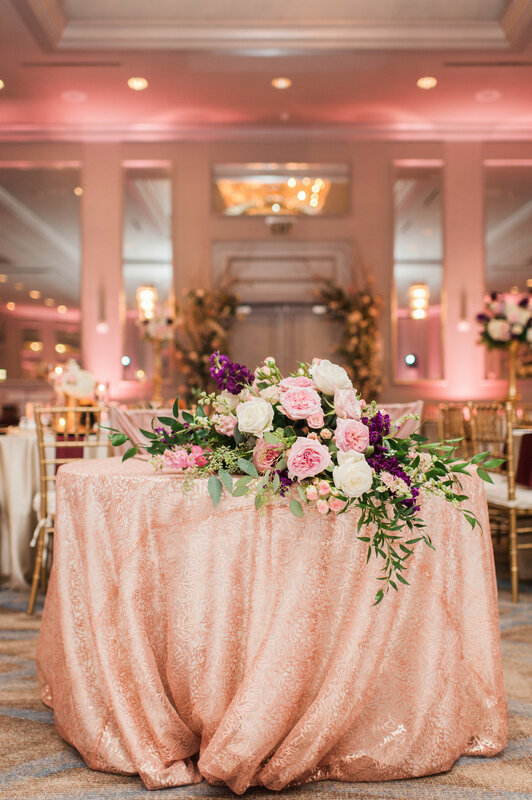 At Susan and Kevin's wedding, guests were wowed by Susan’s attention to detail and the overall design of the ballroom. 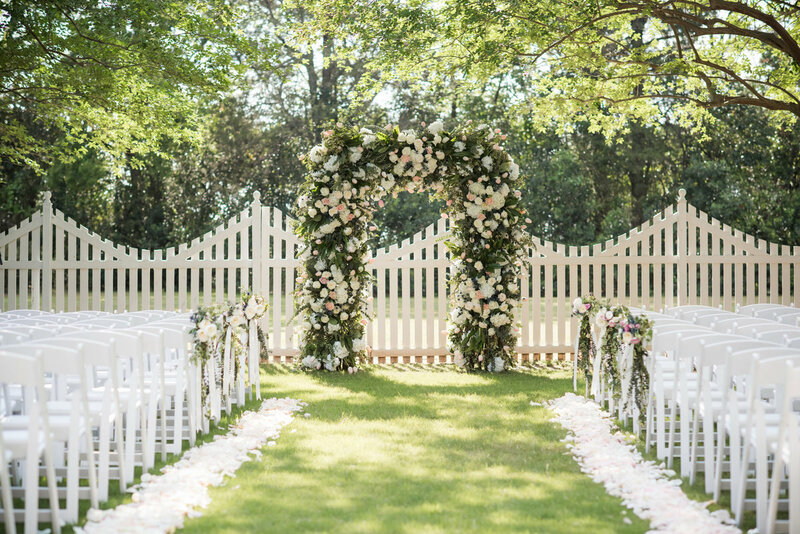 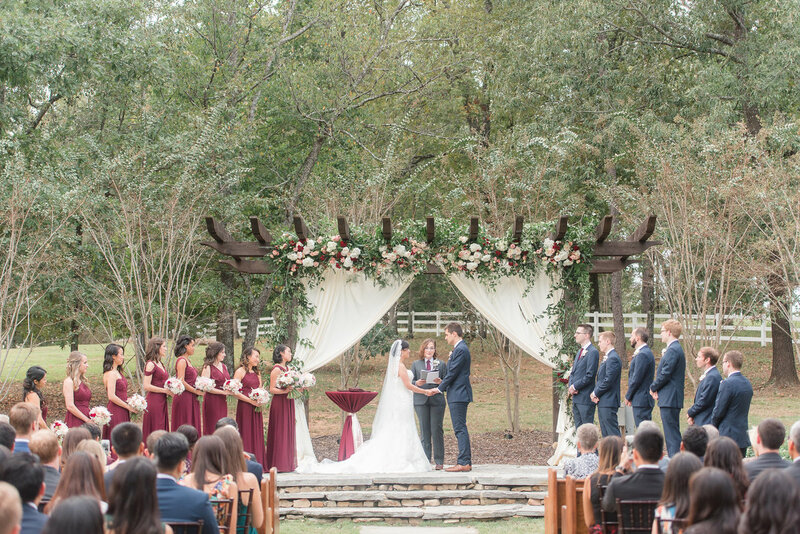 Susan dreamed of a garden feel with lots of ivory, pink, and pops of purple for her ceremony. 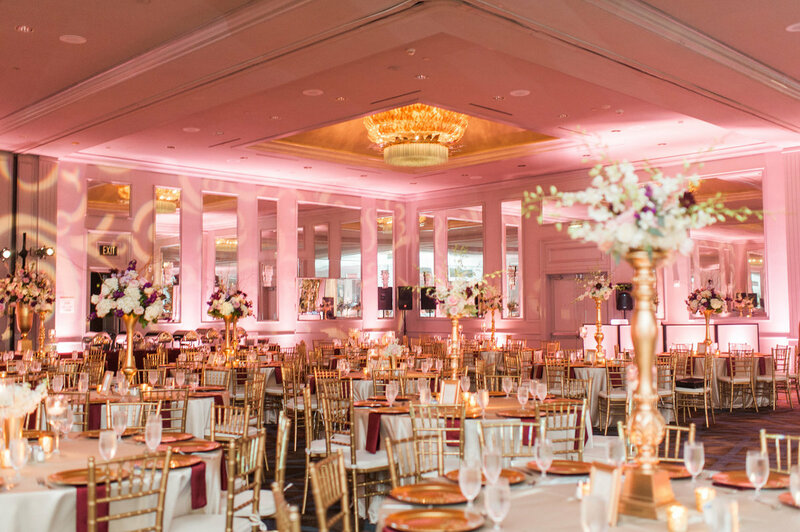 Then came transformation of the ballroom to their incredible reception! 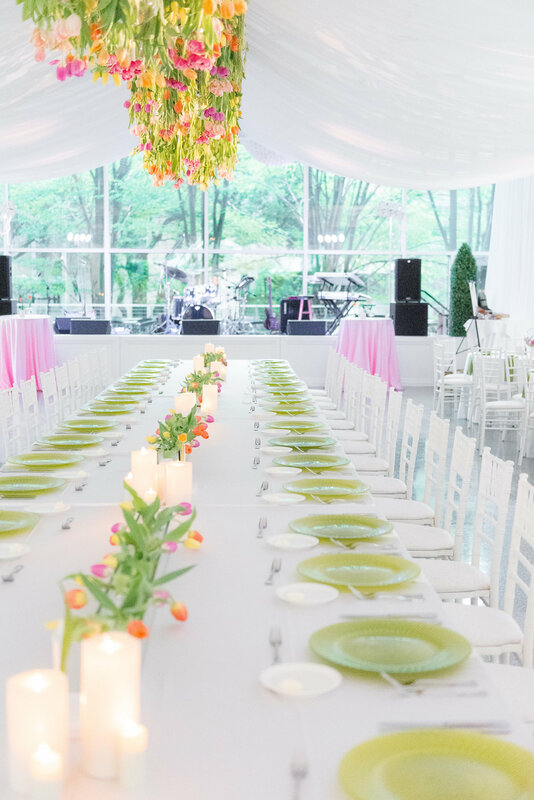 Every vendor pitched in as we created a beautiful space for dinner, dancing and a whole lot of fun. 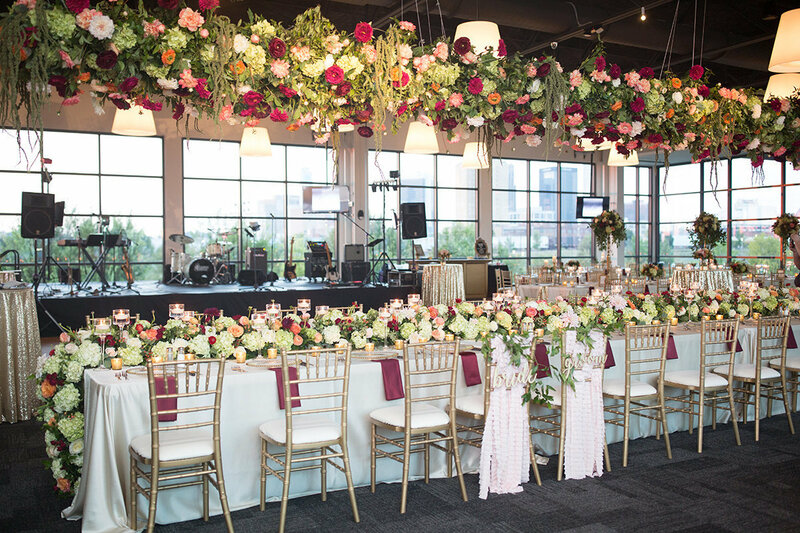 Give us a bride who is a professional interior designer and magic will be made. 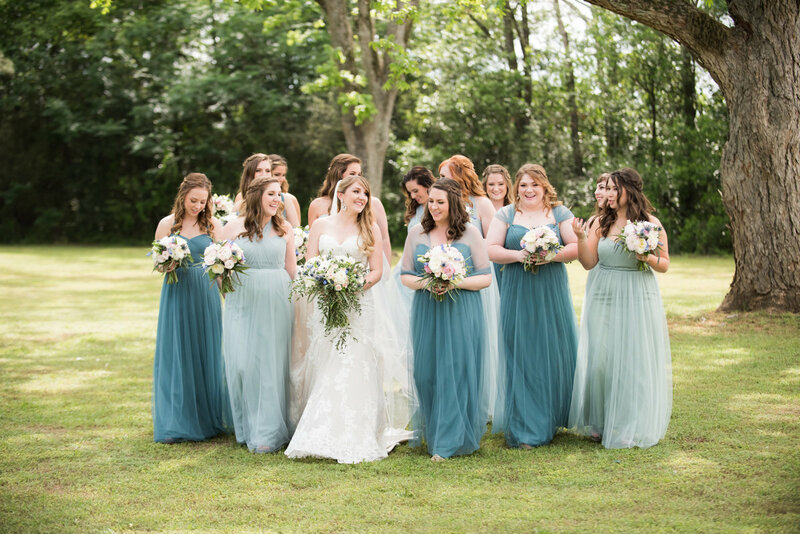 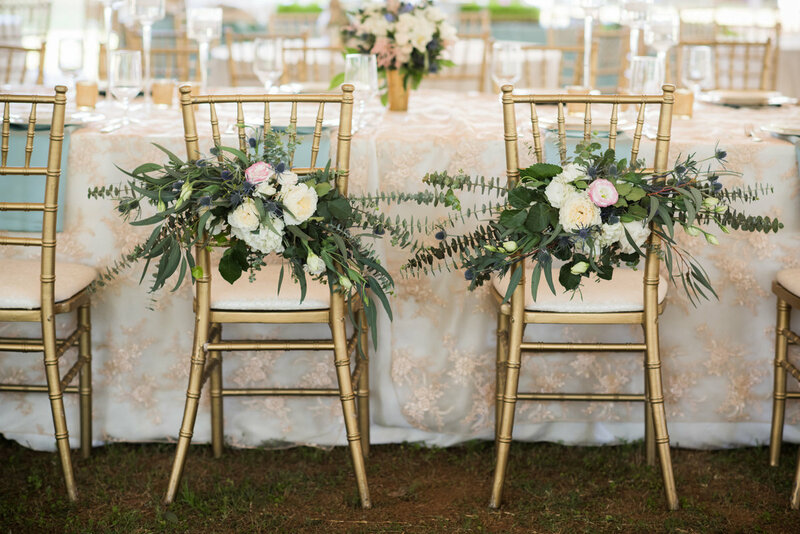 Carmen loves blues, ivory and lots of greenery – and this was the perfect palette to kick off the design. 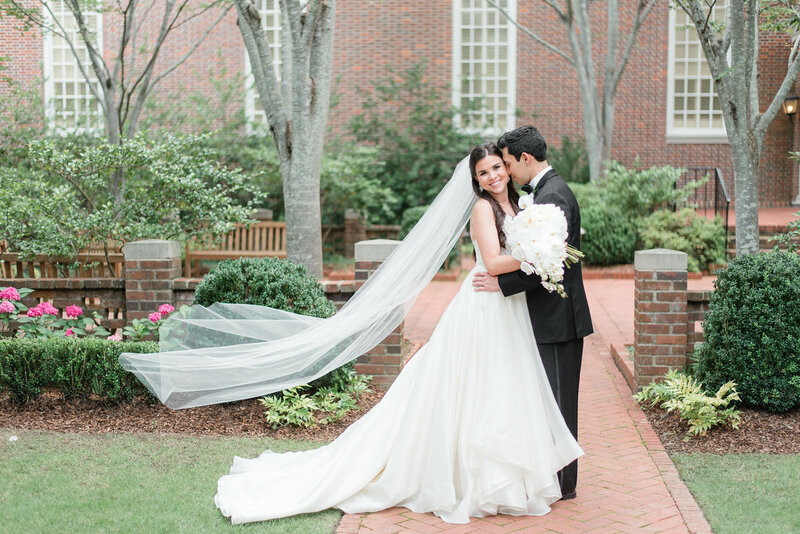 We love a bride with beautiful style who places a big focus on aesthetics and Carmen did just that! 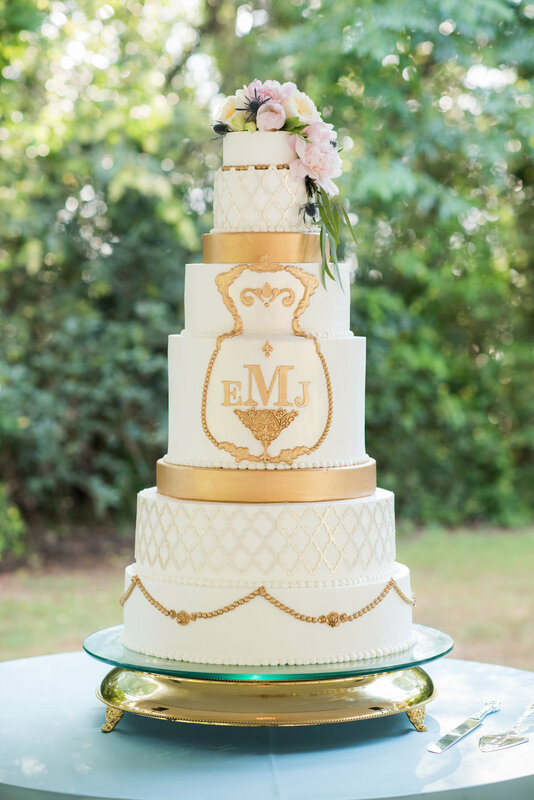 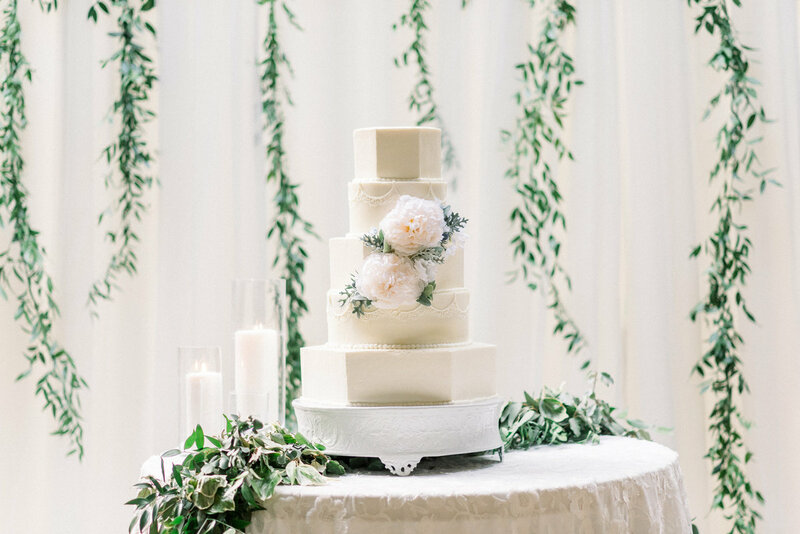 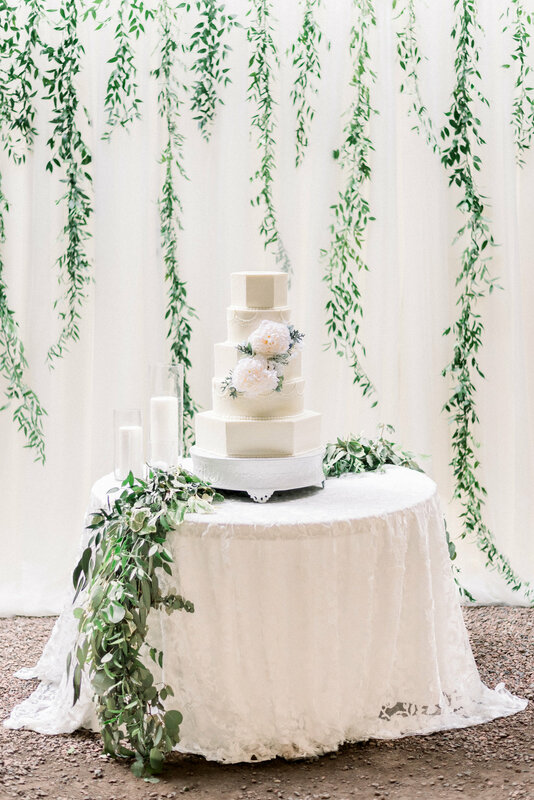 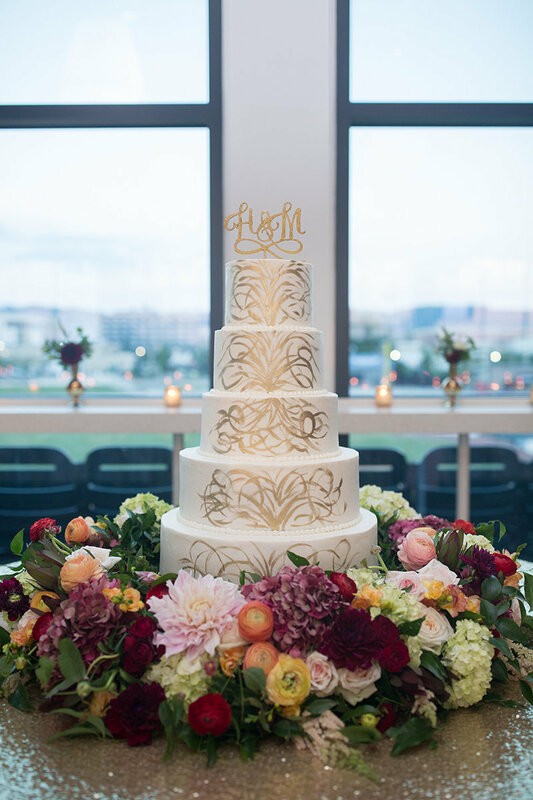 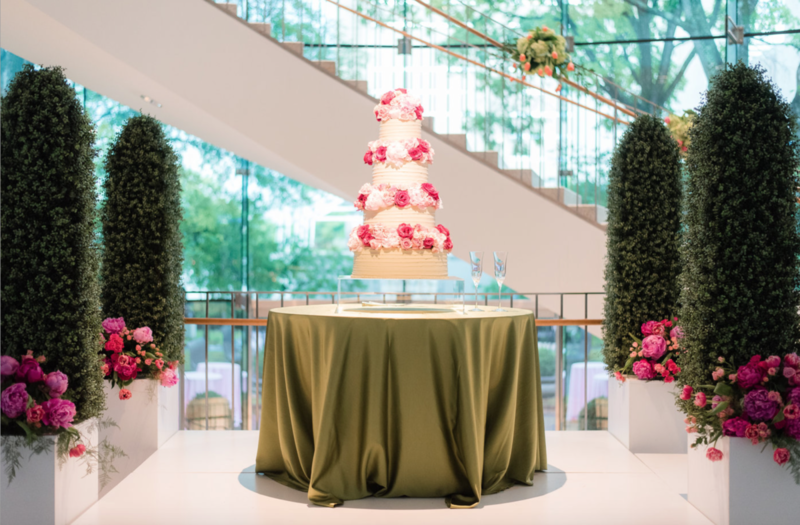 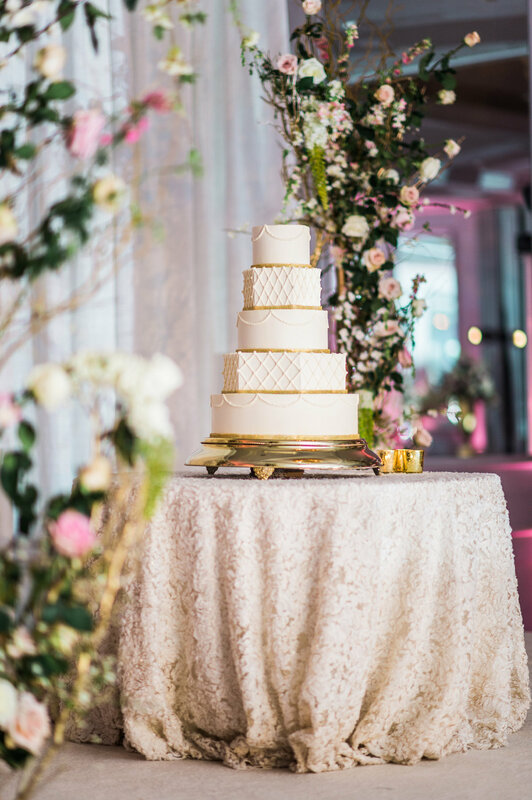 From the beautiful stationery suite to the custom cake design, this wedding made our hearts sing. 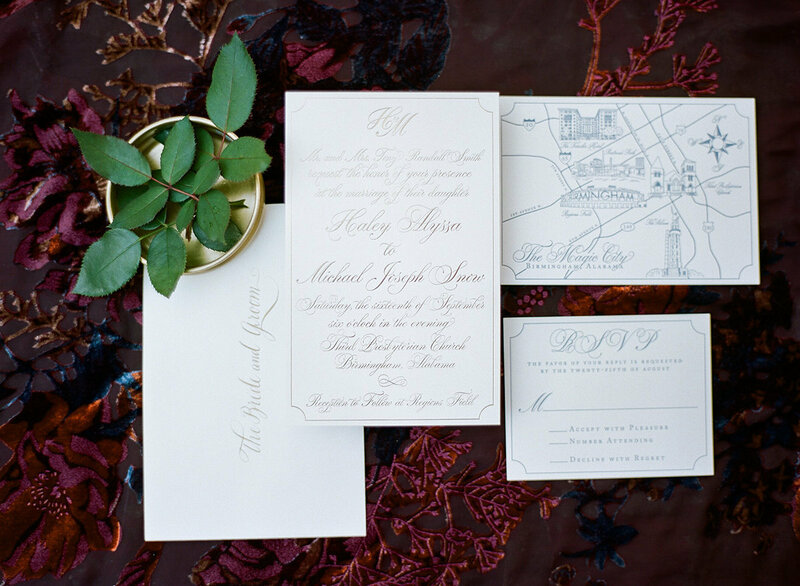 Amazing details everywhere you look? 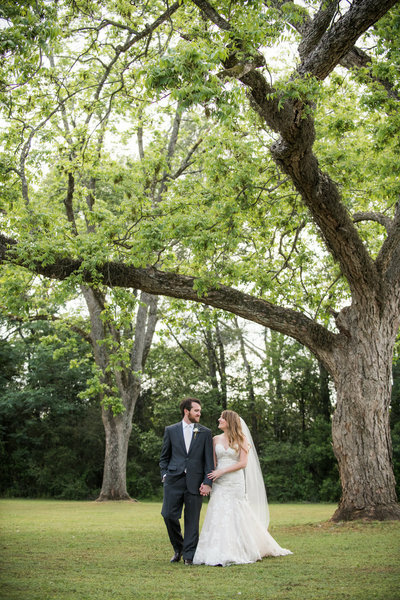 That's our sweet spot. 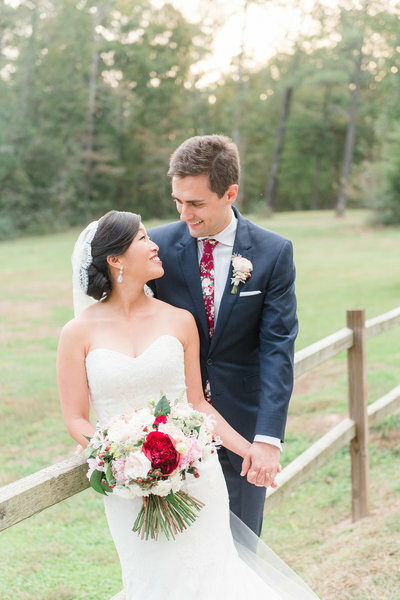 Jun and Bert met at a work Christmas party in New York City and after a few years of dating, Bert asked Jun to spend forever with him with a beautiful proposal in Central Park! 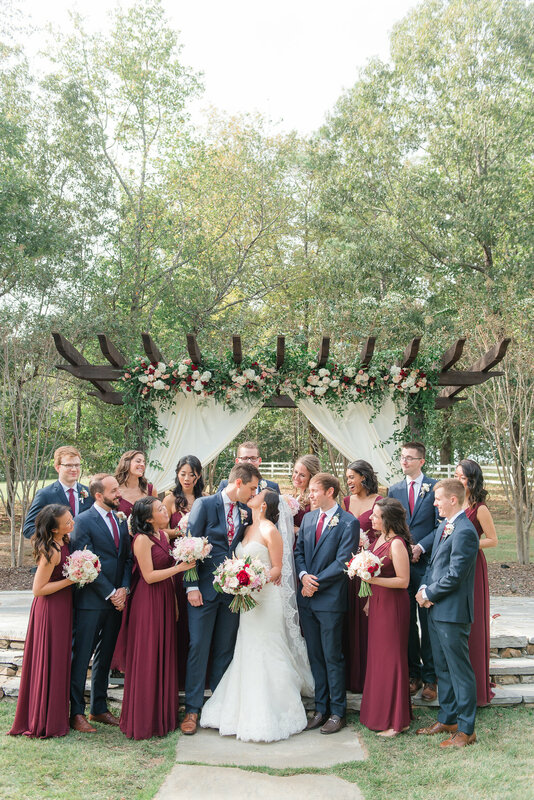 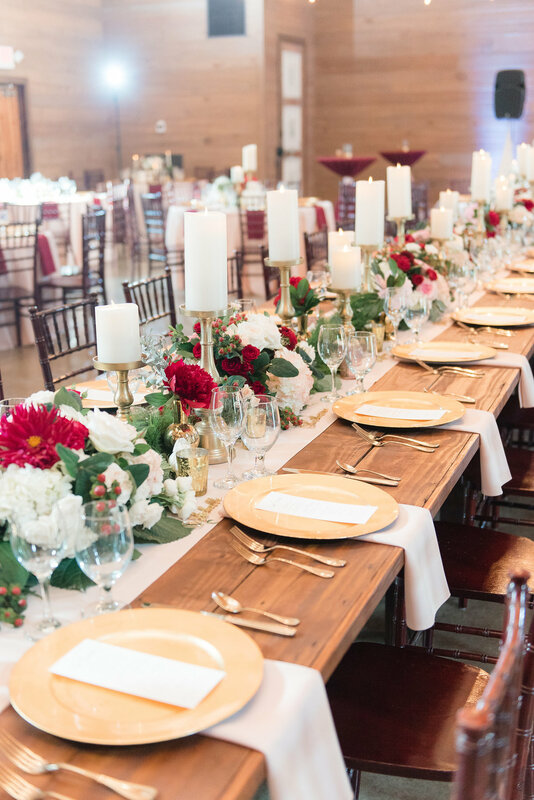 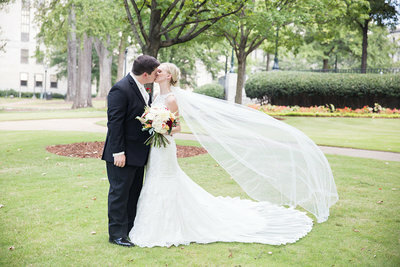 They decided to tie the knot in Bert's hometown of Birmingham and they wanted to have a timeless fall color scheme! 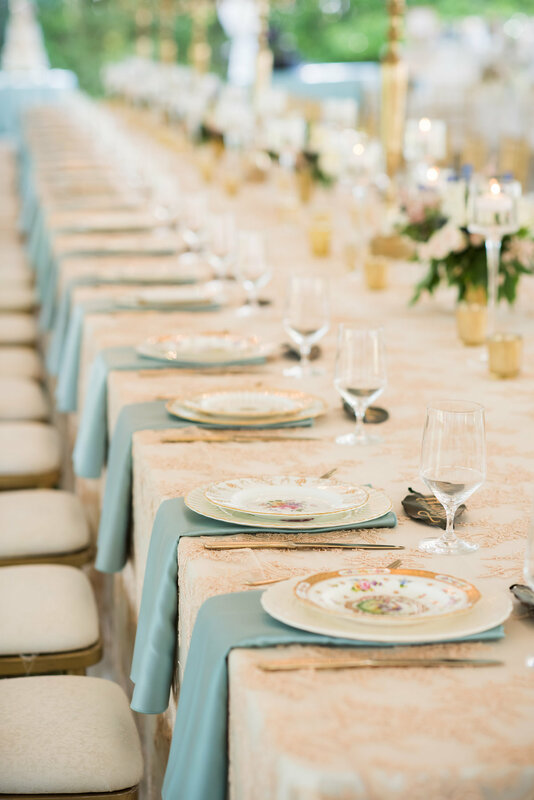 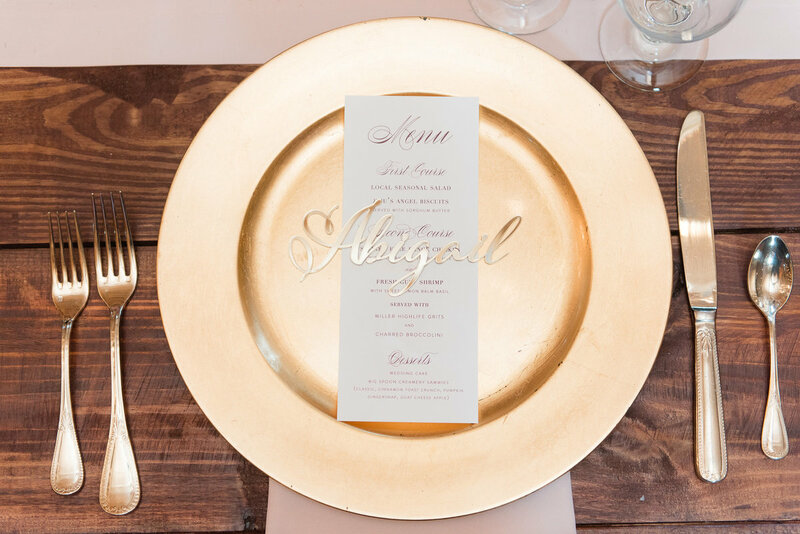 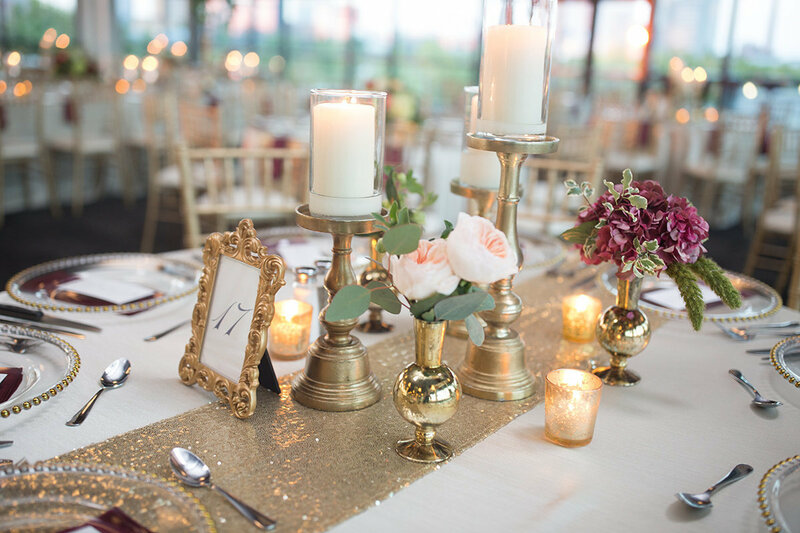 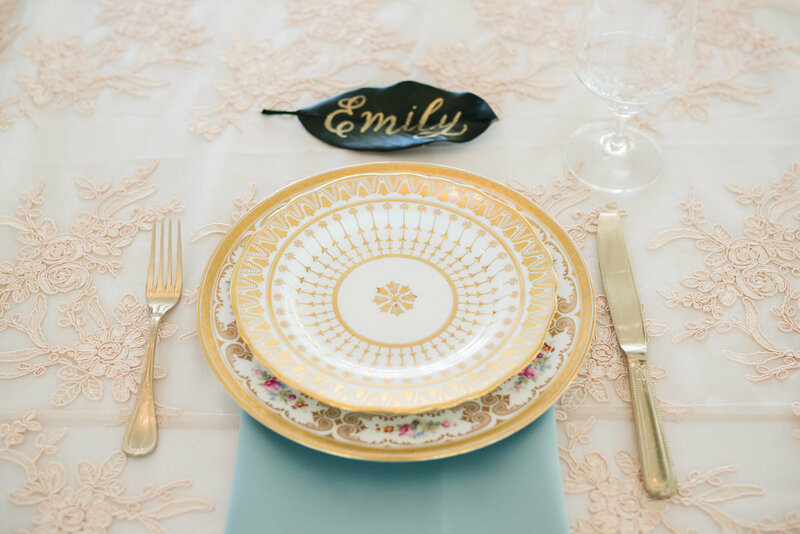 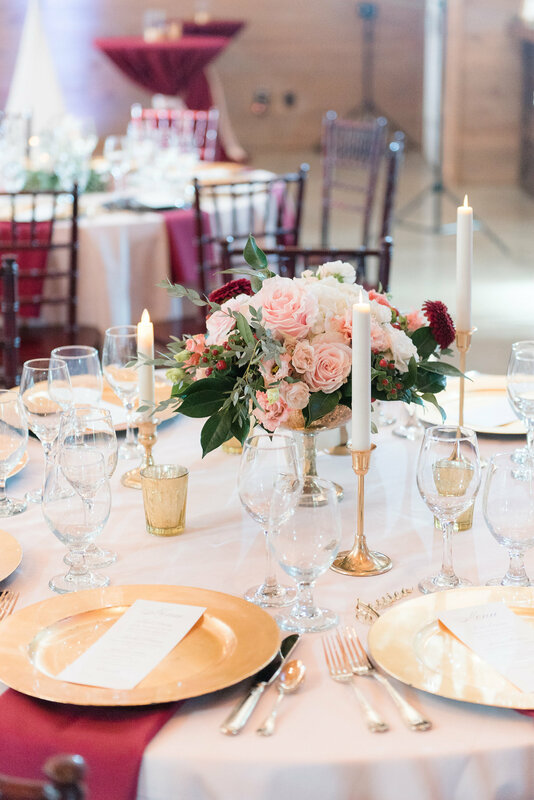 Sometimes planning a wedding from afar can be challenging, but with stellar vendors, it always ends up perfect.